Well, kids! It's getting cooler and short dresses are out of season for the time being. This here is a lesson on winterizing a short and/or sleeveless dress like I did below. First of all, the Bargains! 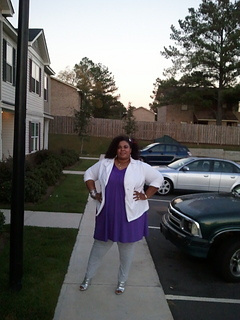 I purchased this purple dress from Cato's for $12, the white blazer (seen before and known as my "Miami Vice") at Macy's for $30, the leggings were purchased from Lane Bryant several several seasons ago and i never wore them! They were $6, the shoes are from Cititrends for $20. Last but not least, I have in my hair what I'm totally loving this season, the return of the feather! (Hopefully you can see it above. My photo upload is giving me problems.) 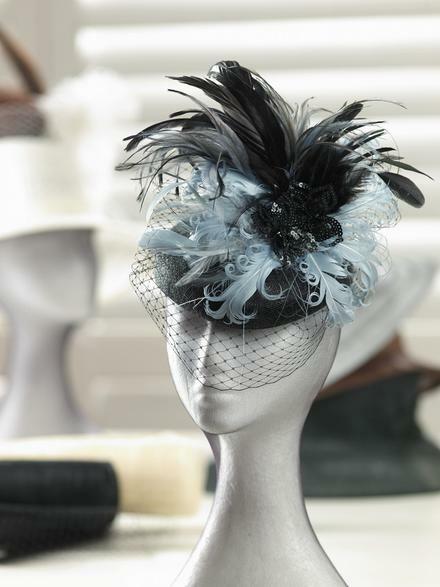 The feather is so 30s and 40s chic! Anyway, this hair piece above cost me $2 at a local beauty supply! 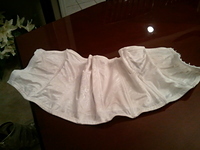 And of course, my trusty undergarment. The almighty waist cincher! 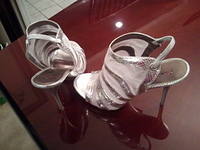 A close-up of my shoes which are surprisingly comfortable! Back to winterizing! There are some do's and don't when it comes to winterizing wardrobe pieces. Do pair sleeveless dresses with a blazer for structure or a sweater/cardigan for warmth. 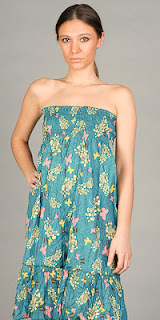 Do winterize dresses that are deeper in color as they will slide into fall/winter more easily than pastels/etc. Don't neglect the weight of the fabric that you are trying to winterize as light fabrics such as those that flimsy sundresses are made from may look inappropriate under blazers/cardigans/coats. See example below. Do consider leggings or tights and play around with the different styles and colors. Don't winterize items that show a lot of cleavage. It just doesn't make sense. Head to Lookville.com to get on their waiting list and be part of the fun! The users very are friendly but honest! They've quickly become my "style family"!! Do I really gotta explain? Okay okay! Dedicated to the feather in my hair, the beautiful Nikka Costa. This song was featured in a Tommy Hilfiger television advertising campaign. heehehhe I used to love this song! Enjoy! Alright sweeties! I love you! Don't forget to "like" me on Facebook! Smoochie Boochies to ya! Jumpin’ Jack Suit with a Little Bit ‘O Flash! black and white? .... boring? you tell me!